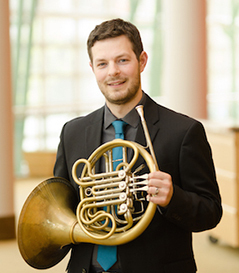 A native of Ohio, Joshua Michal is the Assistant Professor of Horn at the University of Massachusetts in Amherst, MA. He is a member of the Hartford Symphony Orchestra, the Eastern Connecticut Symphony Orchestra, the Lancaster Music Festival and he is on faculty at the Interlochen Summer Arts Academy. Dr. Michal has performed with the Chicago Symphony, Cincinnati Symphony, Boston Lyric Opera, Albany Symphony, Portland Symphony, Charleston Symphony, Columbus Symphony, Dayton Philharmonic, Cincinnati Chamber Orchestra, Chicago Brass Ensemble, and the Breckenridge Music Festival and has toured with the Boston Brass. From 2007-2009, Dr. Michal was a member of the Civic Orchestra of Chicago and was actively involved in music outreach efforts within the city of Chicago through programs such as MusiCorps and the Merit School of Music. As a soloist, Dr. Michal performed The Glass Bead Game by James Beckel with the UMass Wind Ensemble and Concerto No. 2 in Eb Major, K. 417 by W.A. Mozart with the Pioneer Valley Symphony and The Ohio State University Orchestra. He has performed at the International Horn Society conferences at Ithaca College and Hartt School of Music and presented lectures at the Ohio Music Educator's Association Conference in Cincinnati, OH. Dr. Michal can be heard on the Resound Label with the Chicago Symphony Orchestra under the baton of Bernard Haitink performing Mahler’s Symphony No. 2, the Analekta label with L’Orchestre de la Francophonie Canadienne as solo horn for Bruckner’s Symphony No. 4. He recently recorded a CD of premier chamber works by Joseph Summer based on the sonnets of Shakespeare which is due out in 2017. He has also recorded with the Cincinnati Symphony and Albany Symphony. Currently, Dr. Michal is recording his first solo album of world premieres for horn and electronics by Peter Van Zandt Lane, Mark Oliveiro, Salvatore Macchia, and Gordon Green with additional pieces by Tyler Ogilvie. The album is due out in 2017. Dr. Michal received his degrees from Indiana University (B.M. ), Northwestern University (M.M. ), The Ohio State University (D.M.A. ), and he completed additional studies at Bowling Green State University and the IES Institute in Vienna, Austria. His principal teachers include Rosemary Williams, Michael Hatfield, Michael Höltzel, Richard Seraphinoff, Jeff Nelsen, Volker Altmann, Gail Williams, Liz Freimuth, and Bruce Henniss.